Somerset West nestles in the picturesque Helderberg Basin, which is the eastern-most region of the Cape Metropole and combines the towns of Gordon’s Bay, Lwandle, Sir Lowry’s Pass, and Strand. Named after Lord Charles Somerset in 1819 , Somerset West lies directly at the foot of the magnificent Helderberg (“Clear Mountain”) and is surrounded by the Hottentots Holland Mountains overlooking the breathtaking False Bay. Somerset West has become the thriving commercial and residential capital of the Helderberg Basin, whilst maintaining its village atmosphere with a bustling close-knit community and friendly hospitality. Somerset West is situated about 50km from Cape Town, the drive from Cape Town International Airport is 20 minutes, it takes 15 minutes to get to the historical town of Stellenbosch and its wine route and a mere 35 minute drive from Paarl, Wellington, and Franschhoek . The renowned warm water beaches of the Strand and Gordon’s Bay are also within a few minutes driving distance away. No wonder then, that the locals say that here in the Helderberg Basin everything’s here, everything’s near. The climate of Somerset West is typically Mediterranean and mild. Summer season is hot and dry with temperatures ranging between 23C – 33C. Winter season termperatures range between 5C – 22C often with plenty of rain and strong winds at times. The mean annual temperature is a mild 22C. The Helderberg boasts with three 18-hole golf courses, two of which is situated in Somerset West. One is the renowned Erinvale Golf Course designed by Gary Player, which hosted the World Cup in 1996. The other is the Somerset West Country Club. The Helderberg Retirement Village has a 9-hole golf course, and we also have the Vodacom Golf Village driving range. Somerset West also caters for the broad spectrum of sport lovers with tennis, squash, bowls, croquet, cricket, hockey, soccer, a pistol shooting range, hiking trails and a fully equipped gym. All schools in Somerset West are bilingual, co-educational, multi-racial and offer strong academic, sport and cultural enrichment. 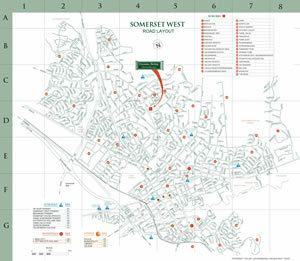 There are three high schools including the latest private Somerset College and four primary schools, one of which is a private junior school. Stellenbosch University , 15 minutes drive, and Cape Town University draws numerous students from here. All the major banks are represented in the town with foreign exchange, credit card and travelers cheque facilities. A wide range of accommodation options which include five star hotels, guest houses, bed and breakfasts and self-catering units are always available. A large modern shopping mall, ranging from large departmental stores to exclusive boutiques, restaurants, cinemas, hair and beauty salons plus all the necessary conveniences is within close reach. A modern private hospital is located in the centre of town, plus four retirement villages with their own frail care facilities. For further information, or any other queries you may have, please do not hesitate to contact Duncan Bailey Properties.